I love being married. It can be a helluva lot of work -- don't get me wrong -- but as a package deal, it's the greatest plan ever. Among the things I love most about being married? I'm like a kid at a sleepover. Every. Single. Night. I was always that kid at sleepovers, the last one whispering into the darkness "Is anyone else still awake?" I treasured the talking for what seemed like hours in the half-light of sleeping bags and pillows as my friends drifted off to sleep one by one. The conversations never really ended, they just got quieter and slower to be continued another day. Many nights now as the clock ticks toward midnight, my husband finally leans over, kisses me and says, "You can keep talking if you want to, but I'm falling asleep." My love of the (bedtime) chat seems to have been genetically passed on to my children, who talk continuously without breaking for breath during the day and don't really slow down at night either. So I probably shouldn't have been surprised when they started sharing a room. It happened at first as a special "sibling sleepover" treat one weekend when I was out of town. 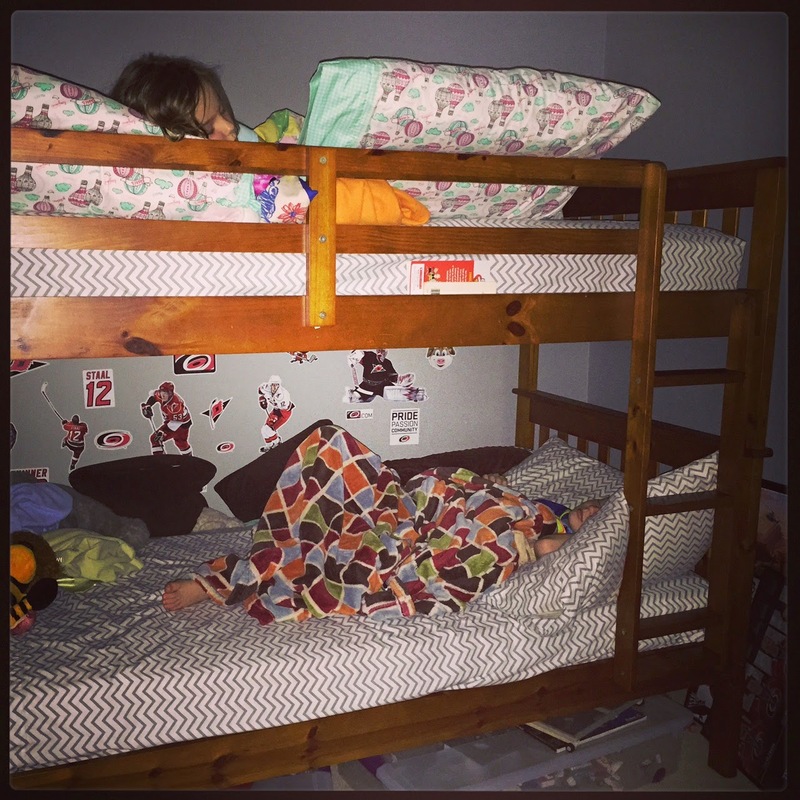 Junius moved up to his top bunk, while Pippi assembled her own pillows, blankets and friends on his bottom bunk. They had fun pretending to camp together, and my husband had an easier time putting them to bed when he didn't have to bounce back and forth between their two rooms. Any day now, I keep thinking she'll want to go back to her double bed and all her own space. Or that he'll get tired of her stuff in his room and kick her down the hall. Instead, the only change they've made is to trade bunks. They even asked if we could turn her room into a play space instead of a bedroom. I said no, knowing that three minutes after I finish, I'll have to turn it right back. But it doesn't matter how long it lasts, this bunk-sharing approach. All that matters is that I will always know -- and hopefully they will remember -- that it ever was. That there once was a time when they shushed each other to sleep because they loved each other enough to tolerate the one sneezing and humming while the other tosses and rattles the beds in exchange for being together just a little bit longer.